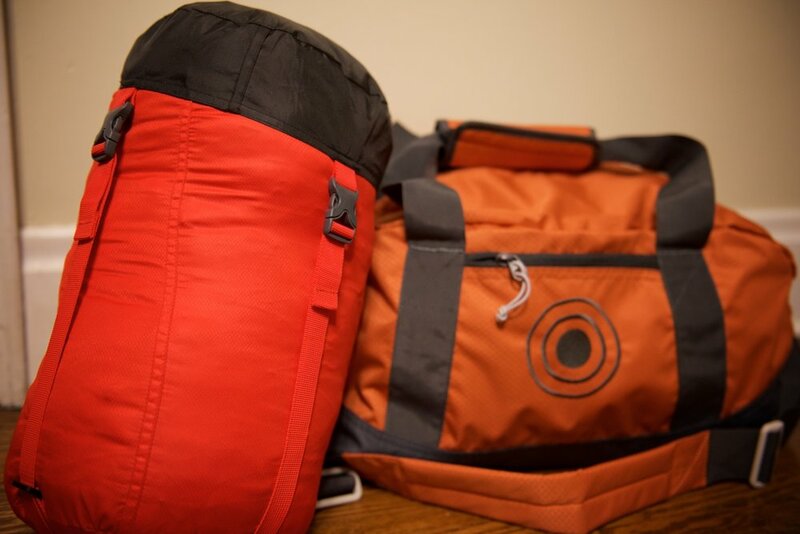 Hotcore expanded their options this year to get you outdoors more often and with the Hotcore Genesis 3-season sleeping bag, you no longer have an excuse not to enjoy the shoulder seasons. This synthetic mummy bag is rated to -7°C (20°F). It comes with a nice compression sack (which it fits in with ease) and weighs a total of 1.44 kg (3.18 lbs). This tapered bag is 203cm (80″ long) being 84cm (33″) wide at shoulders and 48cm (19″) wide at the feet. There is a lot to 'unpack' in this photo, but lots of great features. First, the double zippers run the full length of the bag and provide a bit of venting on warmer nights. The zippers are double sided allowing you to zip up, or unzip from the inside and the main zipper has a nice pull tab so you can easily find it in the dark. The suresoft brushed polyester lining which is warm and very comfortable. You'll notice how comfortable your sleep will be as soon as you touch it. The mummy hood has a drawstring to help cinch up the head of the bag and keep as much heat in place. One common issue with sleeping bags is having the zipper bind when trying to zip it up. Thanks to a strip of black fabric running along both zippers the chance of a snag is greatly reduced. I actually haven't had to fiddle with the zipper so far which is especially nice when you're quickly trying to get in or out of the bag. There is also an insulated draft tube behind the zipper to keep warmth from escaping between the zipper coils. Once you unzip the entire sleeping bag, hidden behind the zipper is a well placed hanging tab for airing our the bag after your trip. The insulation is Trueloft microfiber; 0.7 Denier, siliconized; Critical Layer Construction. I had no problems drifting off to sleep on cooler nights and when the temperature dipped close to the lower range I only needed to toss my jacket over my feet. Just as the name implies... my core was perfectly warm. There are a lot of features on this sleeping bag, but best of all is the price. The MSRP is only $119.99 Canadian. For a three season bag, if you are considering a synthetic three-season bag, this is the one for you. Find a Hotcore sleeping bag at a dealer near you and stay connected with Hotcore by following them on Facebook and Twitter.